100% Sangiovese grapes grown in the Poggio San Polo vineyard go to make this exceptional wine: an elegant and harmonious Tuscan red. 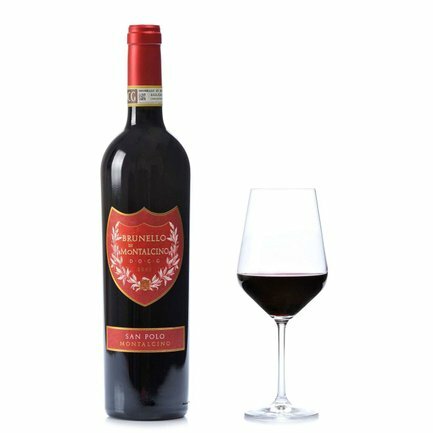 This Brunello di Montalcino greets the eye with a particularly vivid ruby red swirl, glimmering with brilliant garnet tints. On the nose it offers chords of red fruit notes which recur on the palate blended with suggestions of wood, vanilla and coffee. Rich in distinguished tannins, this warming wine is gifted with a splendidly lingering finale. A noble accompaniment for meat dishes, especially game, or matured cheese, or even truffle. San Polo is a project born with the intention of developing and enhancing the features of Montalcino's rich terroir, focusing on the creation of superlative wines intended above all for the international market. Over time, the San Polo estate has been equipped with top quality winemaking facilities, modern and extremely innovative, in compliance with the wishes of Marilisa Allegrini and Leonardo Lo Cascio, who have jointly conceived the project. Key issues for San Polo are the defence of the landscape, the safeguarding of both its fruits and its beauty, focusing on hard work in the vineyards and in the wine cellars.